Just recently, Janhvi and Khushi Kapoor both were spotted outside celebrity couturier Manish Malhotra's house. While the former looked pretty in a white day dress, the later seemed to be in no mood to doll-up. Ditto the feels, late actress Sridevi, gave out last year in one of her airport spottings. It still sits fresh in our memory, Sridevi donning this Dolce & Gabbana jogging suit, while returning to Mumbai after spending a brief time in Los Angeles, USA. Cut-to last week, Khushi wearing the same grey jogger clubbed with a white singlet. It is both, heart melting as well as a great thing to see Khushi make the most of her mom's wardrobe. 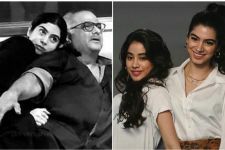 Khushi Kapoor OPENS UP about father Boney Kapoor OVER PROTECTIVENESS! 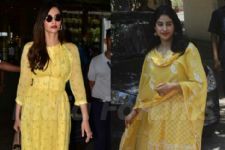 Sonam Or Janhvi, Which Kapoor Girl Is Rocking This Yellow?